"Shrimp salad, refreshing and light, served in a hollowed-out summer tomato. Served as an appetizer, salad, or a light brunch. This was one of our favorite Sunday afternoon treats that my mother fixed for our family." 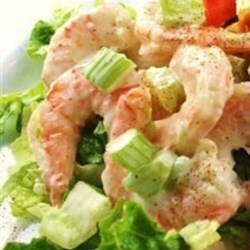 Combine shrimp, celery, onion, lemon juice, salt, pepper and one cup mayonnaise in a mixing bowl. Refrigerate and chill the shrimp mixture for at least one hour. Cut the tops off of the tomatoes and scoop out their insides; chill until the shrimp mixture is well chilled. Scoop the shrimp mixture into the hollowed out tomatoes. Serve. This is a great recipe that looks fancy and is very easy and quick. Great Recipe. I added a teaspoon of Old Bay to liven the taste and diced some avocado at the suggestion of another reviewer. Didn't use quite the amount of mayo called for. Great Recipe!!!!!! I made a mistake when writing up this recipe. Use the bunch of celery. At least 6 stalks! Chop fine. We enjoyed this recipe. I did add a pinch of "Old Bay". This will be my go to recipe for shrimp salad. Thank you for the recipe. I used green onions, half spicy and half plain mayo to eaual about a 1/2 cup, more lemon juice and added 3/4 cup pasta shells and I ate the hole thing! It was great!